"Well, this IS grand!" said Alice. "I never expected I should be a Queen so soon  and I'll tell you what it is, your Majesty," she went on in a severe tone (she was always rather fond of scolding herself), "It'll never do for you to be lolling about on the grass like that! Queens have to be dignified, you know!" So she got up and walked about  rather stiffly just at first, as she was afraid that the crown might come off: but she comforted herself with the thought that there was nobody to see her, "and if I really am a Queen," she said as she sat down again, "I shall be able to manage it quite well in time." Everything was happening so oddly that she didn't feel a bit surprised at finding the Red Queen and the White Queen sitting close to her, one on each side1: she would have liked very much to ask them how they came there, but she feared it would not be quite civil. However, there would be no harm, she thought, in asking if the game was over. "Please, would you tell me " she began, looking timidly at the Red Queen. "Speak when you're spoken to!" The Queen sharply interrupted her. "Ridiculous!" cried the Queen. "Why, don't you see, child " here she broke off with a frown, and, after thinking for a minute, suddenly changed the subject of the conversation. "What do you mean by 'If you really are a Queen'? What right have you to call yourself so? You can't be a Queen, you know, till you've passed the proper examination. And the sooner we begin it, the better." "I only said 'if'!" poor Alice pleaded in a piteous tone. The two Queens looked at each other, and the Red Queen remarked, with a little shudder, "She says she only said 'if' "
"But she said a great deal more than that!" the White Queen moaned, wringing her hands. "Oh, ever so much more than that!" "So you did, you know," the Red Queen said to Alice. "Always speak the truth  think before you speak3  and write it down afterwards." '"I'm sure I didn't mean " Alice was beginning, but the Red Queen interrupted her impatiently. "That's just what I complain of! You should have meant! What do you suppose is the use of child without any meaning?4 Even a joke should have some meaning  and a child's more important than a joke, I hope. You couldn't deny that, even if you tried with both hands." "I don't deny things with my hands," Alice objected. "Nobody said you did," said the Red Queen. "I said you couldn't if you tried." "She's in that state of mind," said the White Queen, "that she wants to deny something  only she doesn't know what to deny!" "A nasty, vicious temper," the Red Queen remarked; and then there was an uncomfortable silence for a minute or two. The Red Queen broke the silence by saying, to the White Queen, "I invite you to Alice's dinner-party this afternoon." The White Queen smiled feebly, and said "And I invite you." "I didn't know I was to have a party at all," said Alice; "but if there is to be one, I think I ought to invite the guests." "We gave you the opportunity of doing it,"5 the Red Queen remarked: "but I daresay you've not had many lessons in manners yet?" "Manners are not taught in lessons," said Alice. "Lessons teach you to do sums, and things of that sort." "I don't know," said Alice. "I lost count." "Nine from eight I can't, you know," Alice replied very readily: "but "
"I suppose " Alice was beginning, but the Red Queen answered for her. "Bread-and-butter, of course. Try another Subtraction sum. Take a bone from a dog: what remains?" Alice considered. "The bone wouldn't remain, of course, if I took it  and the dog wouldn't remain; it would come to bite me  and I'm sure I shouldn't remain!" "Then you think nothing would remain?" said the Red Queen. 'I think that's the answer." "Wrong, as usual," said the Red Queen: "the dog's temper would remain." "But I don't see how "
"Why, look here!" the Red Queen cried. "The dog would lose its temper9, wouldn't it?" "Perhaps it would," Alice replied cautiously. "Then if the dog went away, its temper would remain!" the Queen exclaimed triumphantly. Alice said, as gravely as she could, "They might go different ways." But she couldn't help thinking to herself, "What dreadful nonsense we are talking!" "She can't do sums a bit10!" the Queens said together, with great emphasis. "Can you do sums?" Alice said, turning suddenly on the White Queen, for she didn't like being found fault with so much. The Queen gasped and shut her eyes. "I can do Addition, if you give me time  but I can't do Subtraction, under any circumstances!" "Of course you know your ABC?" said the Red Queen. "To be sure I do." said Alice. "So do I," the White Queen whispered: "we'll often say it over together, dear. And I'll tell you a secret  I can read words of one letter! Isn't that grand! However, don't be discouraged. You'll come to it in time." Here the Red Queen began again. "Can you answer useful questions?" she said. "How is bread made?" "I know that!" Alice cried eagerly. "You take some flour11 "
"Where do you pick the flower?" the White Queen asked. "In a garden, or in the hedges?" "Well, it isn't picked at all," Alice explained: "it's ground "
"How many acres of ground?" said the White Queen. "You mustn't leave out so many things." "Fan her head! "12 the Red Queen anxiously interrupted. "She'll be feverish after so much thinking." So they set to work and fanned her with bunches of leaves, till she had to beg them to leave off, it blew her hair about so. "She's all right again now," said the Red Queen. "Do you know Languages? What's the French for fiddle-de-dee?" Alice thought she saw a way out of the difficulty this time. "If you'll tell me what language 'fiddle-de-dee' is, I'll tell you the French for it!" she exclaimed triumphantly. But the Red Queen drew herself up rather stiffly, and said "Queens never make bargains." "I wish Queens never asked questions," Alice thought to herself. "Don't let us quarrel," the White Queen said in an anxious tone. "What is the cause of lightning?" "The cause of lightning," Alice said very decidedly, for she felt quite certain about this, "is the thunder  no, no!" she hastily corrected herself. "I meant the other way." "It's too late to correct it," said the Red Queen: "when you've once said a thing, that fixes it, and you must take the consequences." "Which reminds me " the White Queen said, looking down and nervously clasping and unclasping her hands, "we had such a thunderstorm last Tuesday  I mean one of the last set of Tuesdays13, you know." Alice was puzzled. "In our country," she remarked, "there's only one day at a time." The Red Queen said, "That's a poor thin way of doing things. Now here, we mostly have days and nights two or three at a time, and sometimes in the winter we take as many as five nights together  for warmth, you know." "Are five nights warmer than one night, then?" Alice ventured to ask. "Five times as warm, of course." "But they should be five times as cold, by the same rule "
Alice sighed and gave it up. "It's exactly like a riddle with no answer!" she thought. "Humpty Dumpty saw it too," the White Queen went on in a low voice, more as if she were talking to herself. "He came to the door with a corkscrew in his hand "
"What did he want?" said the Red Queen. "He said he would come in," the White Queen went on, "because he was looking for a hippopotamus. Now, as it happened, there wasn't such a thing in the house, that morning." "Is there generally?" Alice asked in an astonished tone. "Well, only on Thursdays," said the Queen. "I know what he came for," said Alice: "he wanted to punish the fish, because "
Here the White Queen began again. "It was such a thunderstorm, you can't think!" ("She never could, you know,"15 said the Red Queen.) "And part of the roof came off, and ever so much thunder got in  and it went rolling round the room in great lumps  and knocking over the tables and things  till I was so frightened, I couldn't remember my own name!" Alice thought to herself, "I never should try to remember my name in the middle of an accident! Where would be the use of it?" but she did not say this aloud, for fear of hurting the poor Queen's feelings. "She never was really well brought up," the Red Queen went on: "but it's amazing how good-tempered she is! Pat her on the head, and see how pleased she'll be!" But this was more than Alice had courage to do. "A little kindness  and putting her hair in papers17  would do wonders with her "
The White Queen gave a deep sigh, and laid her head on Alice's shoulder. "I am so sleepy?" she moaned. "She's tired, poor thing!" said the Red Queen. "Smooth her hair  lend her your nightcap  and sing her a soothing lullaby." "I haven't got a nightcap with me," said Alice, as she tried to obey the first direction: "and I don't know any soothing lullabies." "And now you know the words," she added, as she put her head down on Alice's other shoulder, "just sing it through to me. I'm getting sleepy, too." In another moment both Queens were fast asleep, and snoring loud. "What am I to do?" exclaimed Alice, looking about in great perplexity, as first one round head, and then the other, rolled down from her shoulder, and lay like a heavy lump in her lap. "I don't think it ever happened before, that any one had to take care of two Queens asleep at once! No, not in all the History of England  it couldn't, you know, because there never was more than one Queen at a time. Do wake up, you heavy things!" she went on in an impatient tone; but there was no answer but a gentle snoring. The snoring got more distinct every minute, and sounded more like a tune: at last she could even make out the words, and she listened so eagerly that, when the two great heads suddenly vanished from her lap, she hardly missed them. 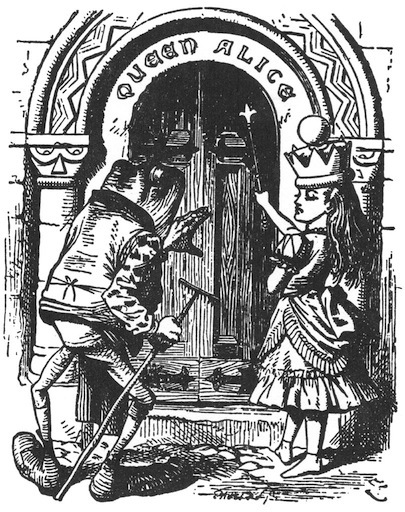 She was standing before an arched doorway over which were the words "QUEEN ALICE" in large letters, and on each side of the arch there was a bell-handle; one was marked "Visitors' Bell," and the other "Servants' Bell." "I'll wait till the song's over," thought Alice, "and then I'll ring the  the  which bell must I ring?" she went on, very much puzzled by the names. "I'm not a visitor, and I'm not a servant. There ought to be one marked 'Queen,' you know "
Just then the door opened a little way, and a creature with a long beak18 put its head out for a moment and said "No admittance till the week after next!" and shut the door again with a bang. Alice knocked and rang in vain for a long time; but at last, a very old Frog19, who was sitting under a tree, got up and hobbled slowly towards her: he was dressed in bright yellow, and had enormous boots on. "What is it, now?" the Frog said in a deep hoarse whisper. Alice turned round, ready to find fault with anybody. "Where's the servant whose business it is to answer the door?" she began angrily. "Which door?" said the Frog. Alice almost stamped with irritation at the slow drawl in which he spoke. "this door, of course!" The Frog looked at the door with his large dull eyes for a minute: then he went nearer and rubbed it with his thumb, as if he were trying whether the paint would come off: then he looked at Alice. "To answer the door?" he said. "What's it been asking of?" He was so hoarse that Alice could scarcely hear him. "I don't know what you mean," she said. "I talks English, doesn't I?" the Frog went on. "Or are you deaf? What did it ask you?" "Nothing!" Alice said impatiently. "I've been knocking at it!" "Shouldn't do that  shouldn't do that " the Frog muttered. "Vexes it, you know." Then he went up and gave the door a kick with one of his great feet. "You let it alone," he panted out, as he hobbled back to his tree, "and it'll let you alone, you know." 'I've a sceptre in hand, I've a crown on my head. Come and dine with the Red Queen, the White Queen, and me.'" And welcome Queen Alice with thirty-times-three!" "'O Looking-Glass creatures,' quoth Alice, 'draw near! Along with the Red Queen, the White Queen, and me!'" And welcome Queen Alice with ninety-times-nine!" "Ninety times nine!" Alice repeated in despair, "Oh, that'll never be done! I'd better go in at once " and there was a dead silence the moment she appeared. Alice glanced nervously along the table, as she walked up the large hall, and noticed that there were about fifty guests, of all kinds: some were animals, some birds, and there were even a few flowers among them. "I'm glad they've come without waiting to be asked," she thought: "I should never have known who were the right people to invite!" At last the Red Queen began. "You've missed the soup and fish," she said. "Put on the joint!" And the waiters set a leg of mutton before Alice, who looked at it rather anxiously, as she had never had to carve a joint before. "You look a little shy; let me introduce you to that leg of mutton," said the Red Queen. "Alice  Mutton; Mutton  Alice." The leg of mutton got up in the dish and made a little bow to Alice; and Alice returned the bow, not knowing whether to be frightened or amused. "May I give you a slice?" she said, taking up the knife and fork, and looking from one Queen to the other. "Certainly not," the Red Queen said, very decidedly: "it isn't etiquette to cut any one you've been introduced to. Remove the joint!" And the waiters carried it off, and brought a large plum-pudding in its place. "I won't be introduced to the pudding, please," Alice said rather hastily, "or we shall get no dinner at all. May I give you some?" But the Red Queen looked sulky, and growled "Pudding  Alice; Alice  Pudding. Remove the pudding!" and the waiters took it away so quickly that Alice couldn't return its bow. However, she didn't see why the Red Queen should be the only one to give orders, so, as an experiment, she called out "Waiter! Bring back the pudding!" and there it was again in a moment like a conjuring-trick. It was so large that she couldn't help feeling a little shy with it, as she had been with the mutton; however, she conquered her shyness by a great effort and cut a slice and handed it to the Red Queen. "What impertinence!" said the Pudding. "I wonder how you'd like it, if I were to cut a slice out of you, you creature!" It spoke in a thick, suety21 sort of voice, and Alice hadn't a word to say in reply: she could only sit and look at it and gasp. "Make a remark," said the Red Queen: "it's ridiculous to leave all the conversation to the pudding!" "Do you know, I've had such a quantity of poetry repeated to me to-day," Alice began, a little frightened at finding that, the moment she opened her lips, there was dead silence, and all eyes were fixed upon her; "and it's a very curious thing, I think  every poem was about fishes in some way. Do you know why they're so fond of fishes, all about here?" She spoke to the Red Queen, whose answer was a little wide of the mark. "As to fishes," she said, very slowly and solemnly, putting her mouth close to Alice's ear, "her White Majesty knows a lovely riddle  all in poetry  all about fishes. Shall she repeat it?" "Her Red Majesty's very kind to mention it," the White Queen murmured into Alice's other ear, in a voice like the cooing of a pigeon. "It would be such a treat! May I?" "Please do," Alice said very politely. "Take a minute to think about it, and then guess," said the Red Queen. "Meanwhile, we'll drink your health  Queen Alice's health!" she screamed at the top of her voice, and all the guests began drinking it directly, and very queerly they managed it: some of them put their glasses upon their heads like extinguishers24, and drank all that trickled down their faces  others upset the decanters, and drank the wine as it ran off the edges of the table  and three of them (who looked like kangaroos) scrambled into the dish of roast mutton, and began eagerly lapping up the gravy, "just like pigs in a trough!" thought Alice. "You ought to return thanks in a neat speech," the Red Queen said, frowning at Alice as she spoke. "We must support you, you know," the White Queen whispered, as Alice got up to do it, very obediently, but a little frightened. "Thank you very much," she whispered in reply, "but I can do quite well without." "That wouldn't be at all the thing," the Red Queen said very decidedly: so Alice tried to submit to it with a good grace. In fact it was rather difficult for her to keep in her place while she made her speech: the two Queens pushed her so, one on each side, that they nearly lifted her up into the air. "I rise to return thanks " Alice began: and she really did rise as she spoke, several inches; but she got hold of the edge of the table, and managed to pull herself down again. "Take care of yourself!" screamed the White Queen, seizing Alice's hair with both her hands. "Something's going to happen!" And then (as Alice afterwards described it) all sorts of things happened in a moment. The candles all grew up to the ceiling25, looking something like a bed of rushes with fireworks at the top. As to the bottles, they each took a pair of plates, which they hastily fitted on as wings, and so, with forks for legs, went fluttering about in all directions: "and very like birds they look," Alice thought to herself, as well as she could in the dreadful confusion that was beginning. At this moment she heard a hoarse laugh at her side, and turned to see what was the matter with the White Queen; but, instead of the Queen, there was the leg of mutton sitting in the chair. "Here I am!" cried a voice from the soup tureen, and Alice turned again, just in time to see the Queen's broad good-natured face grinning at her for a moment over the edge of the tureen, before she disappeared into the soup. There was not a moment to be lost. Already several of the guests were lying down in the dishes, and the soup-ladle was walking up the table towards Alice's chair, and beckoning to her impatiently to get out of its way. "I can't stand this any longer!" she cried as she jumped up and seized the table-cloth with both hands: one good pull, and plates, dishes, guests, and candles came crashing down together in a heap on the floor. "And as for you," she went on, turning fiercely upon the Red Queen, whom she considered as the cause of all the mischief  but the Queen was no longer at her side  she had suddenly dwindled down to the size of a little doll, and was now on the table, merrily running round and round after her own shawl, which was trailing behind her. At any other time, Alice would have felt surprised at this, but she was far too much excited to be surprised at anything now. "As for you," she repeated, catching hold of the little creature in the very act of jumping over a bottle which had just lighted upon the table, "I'll shake you into a kitten, that I will!" 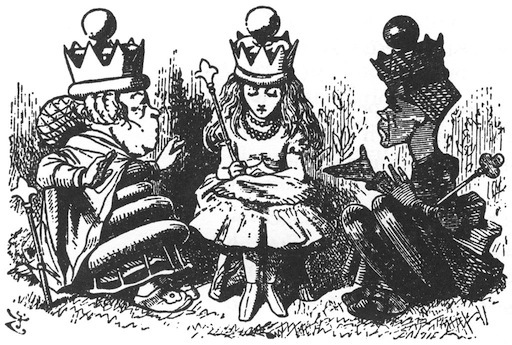 This corresponds to what Lewis Carroll refers to as the Queens "castling" in the Chess Problem. Alice is perfectly right, logically speaking, but the sort of directive the Red Queen gave is one of many directed at Victorian era children. A certain image of children and adult fantasies of children were valourized by the Victorian english, but their views of real children, especially children from poor families, were not so rosy. A child among adults was expected to remain absolutely silent unless asked a question, and heaven forbid they should answer the question in a way that displeased anyone, or if they moved. This was also the era of strict segregation of children to a separate table at meals, if not to a separate room. Some of these practices are still common in former british colonies. There is a further element to Alice's response in terms of social status and meaning. She understands herself to now be a queen (the examination further on is sprung on her apropos of nothing), so she expects to have equal speech privileges with her two companions. It is perfectly possible to think before you speak rather than as you speak. However, most people we speak with would find this intolerable as a regular practice because it would slow down the conversation significantly. More importantly, if you constantly weigh every word in every social interaction, the result is often negative in social terms, because people will perceive you as calculating or even dishonest, or they will deem you stupid. When children are directed to "think before they speak" however, the chances are good they will be reduced to utter silence if they obey the rule, as they find themselves unable to respond to speech cues because they are too preoccupied. Group conversations are actually amazingly complex interactions; game theorists, psychologists, and linguists alike have been trying to fully describe the rules of turn taking and how long a person is permitted to speak for years. There are few ideas more hideous than this, actually. At first blush it seems sensible enough, and the neurotic search for meaning is endemic today, so there's also a trigger for nostalgia in it. Alas, it passes very easily into worse things  refer again to the note above about Victorian attitudes to children. "Meaning" and "purpose" are generally taken as synonyms, so what is the "purpose" of a child? For some a child must indeed have a "purpose," and from the Victorians to now the potential purposes are still surprisingly familiar, especially if you interview more authoritarian-minded adults on the subject. Male children are for carrying on the family name. Female children are for producing more babies and carrying on somebody else's family name, but the consolation is the social connections created by marriage. The children of the poor, who are often excoriated for having any children in the Victorian and presently in the miasma of capitalist fundamentalism, are for the purpose of cheap labour as that is the only real justification for their survival, unless they are somehow exceptional. This terrible logic was already being taken to the extremes of eugenics by Francis Galton in the late 19th century. Scary stuff, even if that was nowhere in the mind of the first person to insist a child, or person, or life, should have a "meaning." Personally, I am of a rather more optimistic bent. According to what physics, geology, and biology teach us (to start with the minimum), the likelihood of life coming about was infinitesimal. The number of variables that came together to bring each of us into the world is another low likelihood thing. Now, obviously low likelihood does not mean impossible, because where there are enough chances for a thing to happen, no matter how unlikely it is, it's chance of happening at all is real. All of which is a very roundabout way of saying, it's a bona fide miracle that we're all here, a real gift. So we don't need meaning in the sense implied by the Red Queen. A satirical illustration of the various catch-22's of manners, which as Alice points out are not taught in lessons. They continue to be taught almost exclusively by example, and therein lies the trouble. To learn from the example, you must have an opportunity to observe one, and you must have enough observations to be able to apply them to various events that may be different individually but similar in general terms. There were and are then, a system of informal lessons, usually imposed at the worst time shortly before a new sort of event. These lessons are a regular feature of situation comedies: the last minute lecture to the bridegroom before the ceremony, the lengthy discursion during the car ride to a graduation ceremony. The most recent neurological studies on short term memory explain why this is literally an impossible sum for Alice. Our short term memory has a relatively short buffer pithily characterized as "seven items plus or minus two" and it accepts input only so fast. This being part of a Looking-glass examination, we should expect that the requirement is that the examinee fail. According to the papers I have been able to look up on the subject, Alice is just at the age where negative numbers are actually understood, but are still difficult to handle when represented as words or figures. (For example, see Young Children's Representations of Negative Numbers by Rute Borba and Terezinha Nunes.) In plainer english, this means that a child that age can certainly tell that they are short a number of items to finish something, and give that number if the task lends itself to a specific count. For example, if they are directed to lay out counters over a pattern of dots on a board corresponding to different polygons. Yet if instead we asked them to count the dots and then the counters, then subtract the number of dots from the counters to see if they had enough, they'd be a bit lost. This is a play on the literal meaning of "division" which is "to separate into pieces or parts." Even if Alice was about to say that a loaf divided by a knife gave sliced bread, she would have been hard-pressed to come up with bread and butter. After all, the butter is an addition! When we "lose our temper" what we lose is control of it. Here the difficulty lies in the phrase being an idiom, in which the words don't literally mean what they say, instead having a socially agreed on meaning. "Losing ones's temper" is an example of an idiom developing from an abbreviated form of the probable original phrase. This type of idiom is rather exceptional. More common are idioms that are actually metaphors, which makes them not only language specific but culturally and even temporally specific. One of my favourite temporally specific ones turns up in Shakespeare with fair frequency, "'Zounds!" It looks and sounds complete nonsense, but is an elided form of the phrase "God's wounds! ", a very archaic swear-phrase. The Queens are repeating a pernicious stereotype here that remains all too persistent today, that one being that somehow having female genitalia dictates that you can't do math. More careful repeaters of this nonsense claim that no, really, it's that female genitalia mean you can't do "advanced math." Except what counts as "advanced math" changes in every generation and from place to place. What we call basic algebra that is taught in grade school was the most advanced stuff of the age in medieval europe, though it had been superseded already by that time in other places. Unfortunately, it seems that their sheer unreasonableness and irrationality are exactly what makes negative stereotypes persist. Well, here's a bit of etymology that is quite surprising. "Flour" and "flower" are actually the same word originally, and the two spellings were used interchangeably both for the flowers in the field and ground up grains right into Lewis Carroll's time. What led to the extension of the term to what we make bread from is the figurative use of "flower" to mean the best of something, according to the electronic OED, and this in turn was applied to the best quality of ground wheat. This also explains the difference between "meal" and "flour." Eventually, as is common for homonyms in english, spelling conventions were used to differentiate the flour you cook with from the flower you pick. Here is a bit of persistent folk medicine. In many english dialects there are still idioms that reflect the idea that thinking hard can lead to a fever or at least a hot head. It is related but not equivalent to the idea widely held in the Victorian era that brain inflammation was triggered by severe emotional upset, presenting as fever and delirium. "Time" especially as reflected in the division of the year into days and weeks, is a socially agreed on construction. So it is possible to have a "set of Tuesdays" or any other day for that matter, if enough people agreed to it. The difficulty would be choosing how to designate what made a "Tuesday" in that case; in the Looking-glass world it seems that a Thursday is defined by the presence of a hippopotamus in the house. In the end, that's probably why over time we have come to settle on a relatively abstract time system, because there aren't many events we can all agree happen regularly and are widely observable. The Red Queen seems to have a fondness for over-extending rules and specific word meanings. The switch from qualities without any social baggage to ones that have it is an interesting choice, and reflects the Red Queen's apparent preference for double-binding statements. As Alice notes, no matter what she says, she is wrong. At this point I found myself wondering why the Red Queen, already established as rather unpleasant, is now becoming ever more rude. It may be that we're meant to connect this with the behaviour of the black kitten, which wakes Alice a little later. On the other hand, it may be related to how Tenniel illustrated the two Queens, one as a rather untidy and easy-going (if prone to periods of grumpiness while knitting) nurse, the other a severe governess-type. The Red Queen's words are of the same condescending type inflicted on women whose intelligence can't be smothered by sexists. 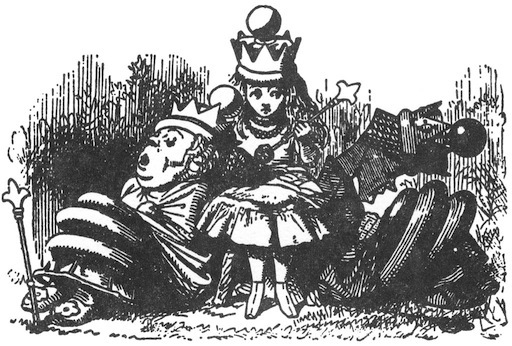 With the Red Queen busily making herself ever more dislikable, it is clear the reader is meant to wonder when she'll get her comeuppance, and how Alice could possibly keep her temper. ...The method is simple and only requires one main item: a brown paper bag. Start by cutting the brown paper bag into long strips about eight inches long and one and one-half inches wide. Once you have completed this task, you are ready to begin your hair setting. Rolling a paper curl is simple. Comb a section of hair and flatten the lock. Wrap a strip of brown paper around the center of the lock once or twice and then slide the paper down to the end of the hair section. Be sure to keep the lock flat while doing all of this. You will then want to roll the hair into the curl using your mold up to your scalp. Remove the mold and take the ends of the brown paper strip and twist them together twice. This is plenty to hold the curl in place through the night. Could this be a borogrove? The old Frog's accent tells against the idea, yet for a moment it seems like this is the original frog footman from Alice's adventures in Wonderland, come upon hard times. They have in common that they are no real help in the face of a closed door, and their preference for sitting under trees doing nothing in particular. Tenniel has equipped the old Frog with a rake, perhaps to imply that he is the gardener. Another nice back-reference to Wonderland, where Alice had left the March Hare and the Hatter trying to put the sleeping Dormouse in the tea pot. The english have a liking for copious amounts of milk in strong tea, and the mice clearly substitute for the milk. "Suet" often referred to as "lard" in north american english (though it isn't really the same thing) is the harder fat, usually white-coloured that is located on "the kidneys and loins" of food animals. It is a staple ingredient in many pastries, especially anything that needs a sturdy crust, such as pies. English "puddings" were more likely to be pastries with sauce, whether sweet or savoury. Hence the yorkshire pudding, which is actually a sort of pastry which is cooked in the drippings of a roast. The gesture seems awfully familiar, yet seems to be something unremarkable between female friends anyway. That said, it puts me in mind of another homeric reference, this one to when one person clasps the hand and calls the name of another person who is upset. The key parallel is the gesture of familiarity prior to delivering some sort of speech. "Extinguishers" in this case being candle extinguishers, similar to the one illustrated below, except for the long handle. Extinguishers with long handles like this were probably first designed for dealing with candelabras and chandeliers. Smaller ones that look like bells with little ring or stem handles were more typical for single candles and would be suitably hat-like for the purposes of Carroll's simile. 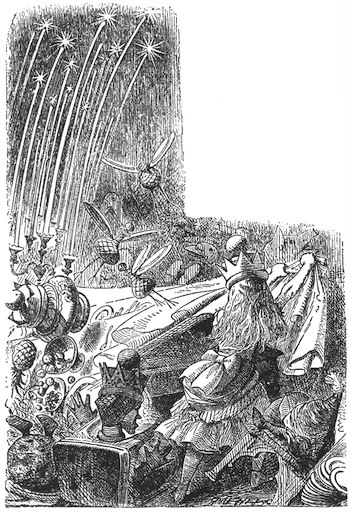 Here is another parallel with the end of the main story in Alice's Adventures in Wonderland: elements of the scene shoot up into the air as the overall scene begins to disintegrate. By now there is no choice left for Carroll but to end things here, apart from the length of the book. He has finally pushed the absurdity of Looking-glass land past the point of real consistency even within itself. 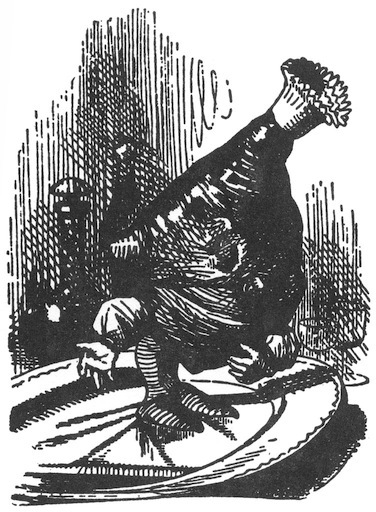 Just to round things off with another interesting detail from Tenniel's illustration, it is worth taking a second look at the rather hideous joint of meat introduced to Alice when she first arrives at the table. The little paper crown the joint is wearing is not a joke, but a practical item. The paper crown covered up the end of the bone in the joint, and may even have served as a handle while carving. Although using the narrow joint-end in this way was probably frowned on, anyone who has tried to cut pieces from a turkey or chicken wing will know how a fork can be less than helpful.